The standard stainless steel cooking bowls (un-wok-like), with a paucity of tone-ballast. The cauldron is perhaps the paradigm of all this tone-drama-seeking malarkey. In fact, it’s surprising that cauldrons aren’t used more often in improv gigs. Objects may be placed in a vibrating cauldron and stirred until the much longed-for ‘tone-drama’ emerges. The cauldron body would be resonated electromagnetically, and eventually, with enough stirring trials, there will arrive a point where a highly specific configuration is obtained, bringing about pulsing rhythms or harmonic progressions. When I was angling to incorporate pseudo-cauldrons into resonant assemblies, the adage “beggars can’t be choosers” manifested itself in the galling fact that dishes and bowls receptive to magnetism are very hard to find. If you walk into a shop, all the stainless steel bowls will be non-magnetic. 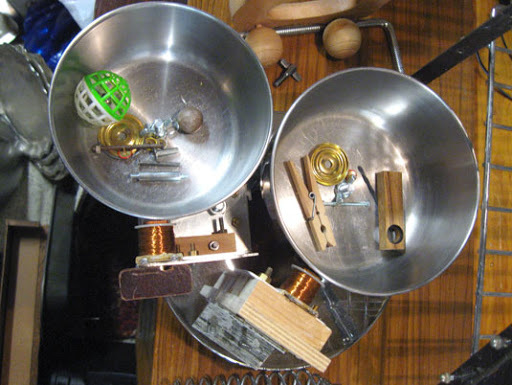 This is frustrating, as many of the most resonant bowls will not be suitable for resonating via the electromagnetic field method (a non-contact method of resonating). Looking in bins and trade waste containers can yield older steel bowls, where the steel was treated differently during manufacture, thus retaining its ferric virtue and allowing for EM resonation. Although, these are rare. 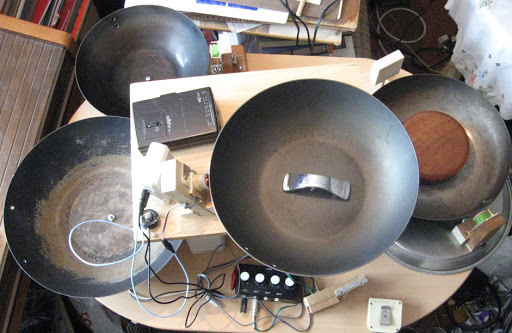 Wok mounted to a sounding board with resonator and pickup coils. Whereas in the past the poverty and unemployability that necessitated my dumpster-diving actions lent a teeth-gnashing restrictive atmosphere, it’s now obvious that this impoverished flâneur approach embraces chance happenings: a good thing. One day, a wok presented itself. 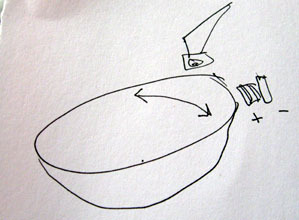 Woks can be easily adapted to resonate. When a wok handle is removed, woks resound like Tibetan bowls… And they’re always (in my experience) responsive to magnetism too. Woks are also somewhat hard to find, but they’re easily spotted, at least, whether in bins, car-boot sales, or vistas of ruin. 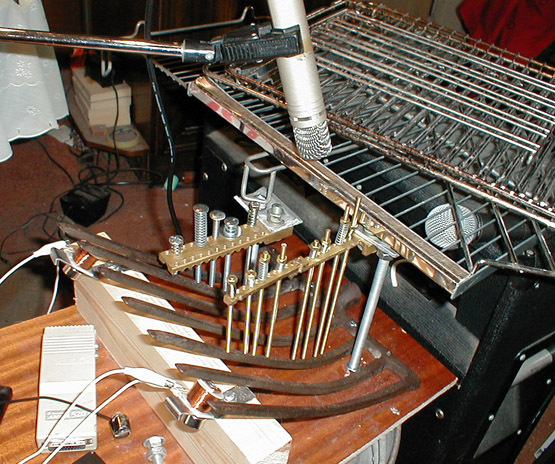 When a resonator coil is fixed in proximity to a wok’s rim, several harmonics can usually be obtained. The most harmonically rich woks happen to be Ken Hom woks – this particular brand was the heaviest/densest I’ve so far found (the chrome handles of certain Ken Hom wok lids also make excellent subharmonic-generating objects to place inside woks). The polarities and phase of the resonator coil / pickup coil combo can be arranged so that a descending scale of harmonics can be elicited by moving the pickup anticlockwise around the rim, on the right-hand side of the resonator (as shown in this scrawling). When subharmonic ballast is added, a veritable sonic stir-fry is formed… with all the potency of the paradigmatic cauldron: thaumatacoustics in action. So far, I have found four woks. It is interesting to note that the resultant chords obtainable purely from the woks themselves – without adding objects inside – are chords of chance provided by the trade waste bins. A convergence of people all deciding at a certain time to discard their woks resulted in this very specific chord. I recorded a short and unpolished study simply to display aspects of this chord. (Please excuse the unskilful pickup collisions)…. 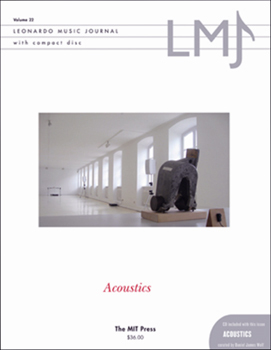 Ivory Tower Misdoings, or "Something for Nothing"
The current acoustics-themed Leonardo Music Journal (#22) features my paper ‘Miraculous Agitations: On the Uses of Chaotic, Non-Linear and Emergent Behaviour in Acoustic Vibrating Physical Systems‘. It gives an overview of the philosophy of miraculous agitations (or thaumatacoustics: acoustics compounded with the prefix ‘thaumata’, meaning ‘wonder’) and methods of electromagnetically resonating object-assemblies. In the LMJ paper, I avoided describing how poverty shaped the philosophies behind miraculous agitation apparatuses. I’ll descant upon this aspect here. Music is traditionally composed – or ‘worked out’ – in ‘horizontal’ time (as most music sequencers scroll). Thaumatacoustic apparatuses on the other hand are scrounged together, assembled and ‘worked out’ beforehand in an instance removed from time. So the ‘work’ goes into the arrangement of global conditions outside time. 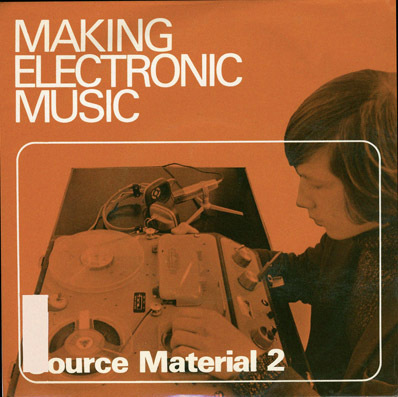 The composing here is principally a process of searching for objects, assembling objects and arranging an initial state in ‘vertical’ time, before the electromagnetic agitators are even switched on. It’s more about ‘compositing’ than ‘composing’. The actual tonestuff emerges over time, almost of its own accord, from largely unforeseen interactions within the assembly. For an apparatus to be capable of producing sonically useful ‘wonders’, patience and perseverance is essential. It is true that the apparatus is built from stuff pulled out dustbins – this is perhaps the part that the aforementioned critic took issue with. This seems a contentious area (and it really shouldn’t be). To this day, passive-aggressive people still crow “should you be doing that?” and “go away” whilst I’m searching for acoustic parts in bins. I’d be a great sound designer, researcher or archivist at the British Library’s sound archive (for example), but frustratingly, employment has not been forthcoming. I’ve ranted about this elsewhere… Jobseeker’s Allowance was cut off. Poverty compelled me to rummage through bins, for food, entertainment, tools and raw materials for quasi-saleable crafted miscellany (including miraculous agitation assemblies). It’s scandalous to behold how much usefulness gets discarded. The thaumatacoustic philosophy is ensconced in these experiences. I was wondering if you might be able to help me. I work for a TV production company called RDF Television and we are currently working on a new show for Channel 4 – which looks into all the weird and wonderful things you can get for free. 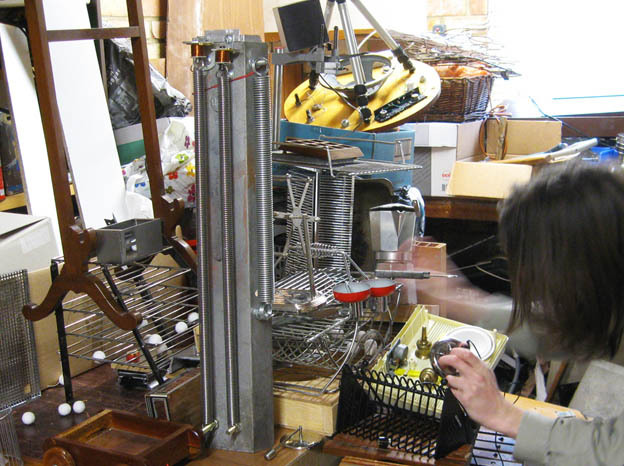 I have come across a sound artist called Dan Wilson who creates musical instruments out of unwanted goods and electrical parts he finds in skips and I read that he sometimes performs with Oscillatorial Binnage. I would really like to have a chat with Dan but can’t find any contact details for him any where. I was wondering if you could let me know if there is any way of getting in touch with him or perhaps you could forward this email on to him so he can get in touch with me? Just want to have a chat with Dan about what he does. You can contact me here or my email address is —- or my direct number is —–. These TV researchers often cast their net widely, and I did suspect that they might find me too weird a fish for their fishtank. I described my practices and provided links to various examples, but also lamented that I couldn’t produce more expository audio examples due to lack of equipment (more high quality microphones would be a Godsend). I’m not sure how much I explained about the show. We’re making a consumer programme for channel 4, that looks into all the things you can get for free – weird and wonderful things that you might not think of. I really liked the idea that you make instruments from electrical items you find in skips and that is what I was interested in talking to you about. We’re looking for people who are experts in their field who would like to talk on camera about their experiences – for example the pitfalls of skip diving / the best places to go for the best finds – so we’re looking for a spokesperson who can tell us about the ‘art’ of skip diving. It’s not so much about the music itself, I’m afraid. I’m not sure if this is something you would be interested in at all? Yes – it sounded worthwhile and useful exposure. But then came the bitter irony. Any payment? “There is no payment, I’m afraid, as we don’t have the budget.” So, a programme about the “weird and wonderful things you can get for free” is trying to source the raw materials for free! This reminded me of a certain King’s Cross publisher who, some years ago, sought to find homeless ‘renegade gardeners’ to write for them about their personal experiences of homeless gardening. There was no payment for this work, yet the book would retail for +£15 per copy. The reply was defensive and ambiguous: “It is a factual documentary to show the general public that there are benefits to be had in this time of financial crisis. And in no way will we be showing ways in which to take from people who really need it.” (‘Benefits to be had in this time of financial crisis’?!?) One media behemoth I once dealt with some years ago had its minions bandying about the term “loser generated content” with some enthusiasm, and I’ve been wary of these sapping dilettantes ever since. Disappointments far outnumber wonders when searching for miraculous agitations. I sighed, and an apparatus set on a cardboard box sympathetically buzzed in an interesting manner.